I've decided to write this walkthrough from the perspective of entering through the East Gate. Upon first entering there's a row of apartments to the south. The last apartment in the row is Sara's home. Sara is Shayder's mage. She'll sell you mage spells, and identify your items. If you talk to her enough she'll tell you to talk to Arkley the librarian. Right across the street from Sara's Shop is Nell's House. If you remember, Nell is in Farport, Krizsan Province, and gave you a quest to clear her home of roaches. Continue to the west, past the guardhouse, and you'll come to another set of apartments. The first is the sailor's lodging. The next apartment contains some people who will respond to your intrusion by attacking you. Feel free to kill them and take their items. There's a little side passage on the western side of the building which I will talk more about later. Now I'll mention several people who wander around the town. The first is Vlad, who's a light salesman, which means he sells lights of all types. The second person is a beggar named Sick Boy. If you give him a few coins he'll tell you to talk to Judith about a certain artifact. This takes us to the third person. Judith isn't always in Shayder, since she travels between Shayder and Bavner. Once you've found her talk to her about the artifact and she'll sell you the location of the Fury Crossbow for 1000 coins. The last person wandering around in Shayder is Bohman, who sells a variety of potions. Back to the buildings now. Just to the north of the docks are two small buildings. The westernmost one doesn't contain much of anything, but the second one has a few potions in it, which require Dispel Barrier Lv.2 or a Piericing Crystal to reach. Just to the east of these two buildings is the inn. The innkeepers name is Mickie. Buy some amber ale off of her, and then take some of the stronger stuff. She'll tell you to talk to Irvine, who's in the corner of the inn. Go talk to Irvine and he'll give you a quest to take a package to Lorelei. The package is in the chest at the end of the short passage beside the room where you had to fight the occupants. Be aware that once you take the package you'll have to sneak into Lorelei until you get rid of it, since it contains Skribbane Herb, which is illegal in Lorelei. The easiest way to sneak into Lorelie is to use Ernest's Teleporter. East of the inn is the "mall". There are three shops in here. The northern one is Rippel, who sells food, the middle on is Begbie, who sells weapons, and the southern one is Renton, who sells armor. The next building to the east is the adminstrative center for Shayder. The southern office belongs to Grunders. He's the Job Dispatcher, and will also sell you a few really nice items, including Blessed Steel Helmets and Blessed Pikes. If you have Anama Rings he'll also give you a quest to find his lost ring, which can be found in the Shayder Sewers. The northern office belongs to Mayor Berthany, who will give you the quest to end the Roach Plague. There's a door in the mayor's office that leads to a small library to the south. You can find a Bolt of Fire scroll on the shelves in there. To the north of the east gate is a row of small rooms. The first is a guardhouse, the second is a gardening storage room and the third is an apartment with nothing much in it. Just north and slightly to the west of these rooms is the Library. You can find Arkely the librarian here. He'll sell you maps of Bigail, and he'll also give you quite a bit of useful information. He'll tell you about Purgatos in Kneece, and about the GIFTS. If you haven't already completed those sections you're going to have to go do them now before you can finish the Roach Quest. The GIFTS give you the location of the Friendly Roaches, who in turn give you the location of the Filth Factory, and Purgatos gives you the Phoenix Egg, which you need to destroy the Filth Factory. The large building slightly to the south and west of the library is the hospital. It's run by Jed, who will give you a quest to bring him a Graymold Salve. Once you've given it to him he'll tell you to talk to Meena, who will teach you the Pathfinder skill now. The western room off of the hospital's main room is a store room with some potions, elixirs and potion-making herbs which you can steal if you want. Next to the North Gate is a guardhouse and a small room with a trapdoor. The trapdoor leads down to the Shayder Sewers. 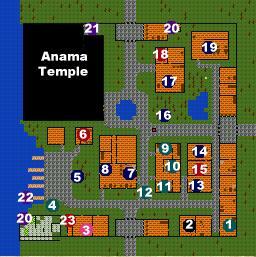 The last building in town is the Anama Temple, which I've chosen to cover in a separate walkthrough. The double doors across from the hospital can be entered freely, but the door to the north, with the rune in front of it can only be entered if you have Anama Rings. The last thing in Shayder is the boat at the docks, which takes you over to Marish. Now we'll head to the Filth Factory to end the Roach Quest.